A couple of summers ago, I hosted a brunch at my house for new moms of multiples (twins, triplets, etc.). One of the ladies who came brought me a calla lily, which I planted by the house. I don't remember her name or what she looked like. But every year the calla lily blooms, with a few more flowers than the year before. And it is absolutely my favorite flower. It makes you think, doesn't it? Some small act of kindness that you do for someone you don't know can still bring happiness to that person, even years later. Readers, have you given or received any random acts of kindness lately? While recovering from surgery last march, I received a lovely package in the mail from a knitting buddy. Yarn, a novel I had been wanting to read, tea, handcream, and a beautiful card with a heartfelt note. Later the same day, another friend sent the loveliest bouquet of spring flowers. Such a surprise and so needed in the bleak of winter. I realized how important friendships are to a person. I knew I would get special attention from my family, and I did. (loved your care package and visit in the hospital) But it was so unexpected from others. I hope those ladies know how much it meant to me. What pretty flowers! She sure brought a wonderful gift! What a delightful gift! I hope the lilies are sufficiently random that they take over a bit more space every year. I think they're much prettier than dandelions. One of the most precious acts of kindness I have experienced happened when I was 16 and had just lost my Mom to cancer. It was several weeks after the funeral when the doorbell rang. I answered it and it was a little girl, about 6-7, holding a pie. She didn't exactly know what to say and looked to her Mom waiting in the car. The Mom motioned for her to give me the pie. As she did, she said 'Happy Spring'. I don't know who that little girl was. I vaguely recognized them from church. I can only imagine the little girl and her Mom discussing how I had lost my Mom. Even now after 29 years, I'm so thankful that little girl wanted me to have a happy spring. What a lovely plant! We never know what our small attempt at reaching out to someone will do. This reminds me that I need to do more of that. It's beautiful and such a sweet gift to give someone. My sister gave me a lily one year and it has since multiplied into many. I always smile when I remember the time she was here and the joy we share when together. What a lovely gift--and one you enjoy for such a long time! I thought it was kind of this girl to tell me Sunday as we left church how much she enjoys me as her Sun. School teacher. What a nice gift! A beautiful flower. So pretty! I love flowers that come back each year. And that certainly is a gorgeous flower!! This is really neat. Gifts like these keep giving. Callas are magnificent. We have many blooms around our yard that we received as gifts from friends who.know we like to garden. :). In fact, a couole who are neighbors gifted us with a two foot tall cedar tree in a pot 6 years ago. We planted it out back, and it's now 12 feet tall. Lol. I just love your beautiful calla lily. My yard has many trees and flowers that family and friends have given us over the years. All our friends and family know if they are getting rid of a tree or plant ask us first. 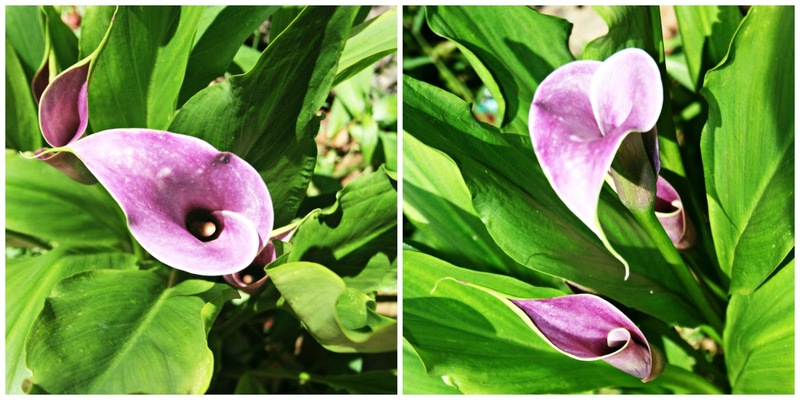 I have some photos of Calla Lilies and info on them. They are strangely beautiful. BUT I have never seen one in this beautiful color!! Gorgeous. My father-in-law had Callas--and they were so pretty... We've never had one... Maybe sometime, we'll find some room and get one. The small things we do for others count so much more than the big, flashy things. I love the callas. Definitely one of my very favorite flowers too! How sweet to have such a lasting memory. I had one a few months ago...From YOU! I think of you and thank you almost everyday! What pretty flowers! And your thoughts are "right on." Calla Lillies are beautiful but I have never grown one. Maybe I should try. Isn't that wonderful that you are still loving and enjoying it? It is beautiful. I do like you thoughts on Random Acts of Kindness.